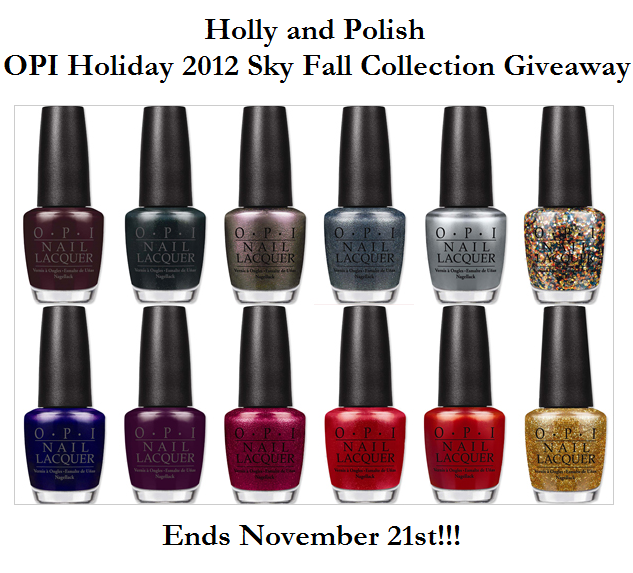 Holly and Polish: A Nail Polish and Beauty Blog: OPI Holiday 2012 Skyfall Collection Giveaway! I so excited to announce that I, yet again, have been blessed with the opportunity of hosting another giveaway for you guys! This time, one of my lucky readers will be receiving the entire OPI Holiday 2012 Skyfall Collection ! Me, Golden Eye, Casino Royale, You Only Live Twice, Skyfall, On Her Majesty's Secret Service, Tomorrow Never Dies, The World is Not Enough, Moonraker, Live and Let Die, The Living Daylights. -This ends on November 21st at 11:59 PM CST. Awesome giveaway! Thanks much for the chance to win some fantastic polishes! Good luck to me! Thank you Holly! Oh my goodness. Oh my. Wow. Yes. Please. Yes. Thankyou! I love nail polish... Awesome giveaway. What an amazing giveaway. I've been wanting at least a few of these so badly! Is there a way to tell if I already entered this or not? It has been a while I can't remember. finished, fingers crossed, Great giveaway! I Love polish!